← Mark Cavendish – What a year!! 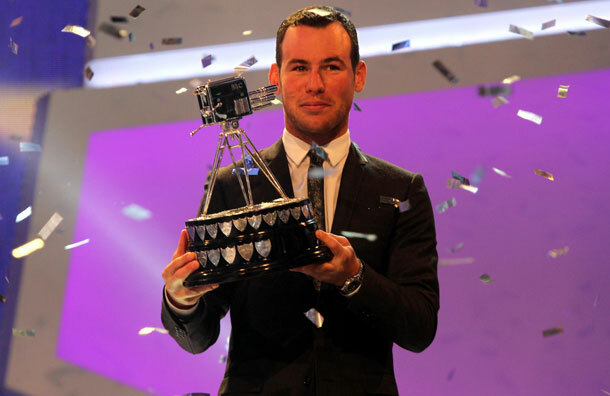 Huge congratulations go out to Mark Cavendish for winning Sports Personality of the Year!! We were behind him all the way and its great to see him being recognised for all his hard work – very well deserved!! The world road race champion and Tour de France green jersey winner beat Open golf champ Darren Clarke, who was second, and world 5,000m gold medallist athlete Mo Farah in third. Cavendish got 49.5 per cent of the 342,147 total votes in a landslide win. “It couldn’t be better,” he said. “In my professional team next year I am carrying the rainbow jersey which gives an added incentive to do well. “But there couldn’t be a more perfect way to go to the Olympics than being Sports Personality of the country. Cavendish is only the third cyclist to lift the prestigious televised award after Tommy Simpson in 1965 and Sir Chris Hoy in 2008. It is reward for winning five stages of this year’s Tour de France – including the coveted final run into Paris – to clinch the Green jersey awarded to the race’s best sprinter. And Cavendish then helped British cycling claim gold at the World Championships in Copenhagen in September where he collected the rainbow jersey. England’s Asheswinning Test cricketers were named ‘Team of the Year’ and Andy Flower picked up the ‘Coach of the Year’ accolade in Manchester. Flower said: “This is a very proud moment for me. I moved from Zimbabwe and England has been very good to me and my family. “The team have done some wonderful things over the last couple of years and it is great to be part of that. Novak Djokovic won Overseas Sports Personality of the Year after dominating men’s tennis in 2011, while Sir Steve Redgrave won the Lifetime Achievement Award for his contribution to rowing. The young sports personality award went to 17-year-old golfer Lauren Taylor, and former Grand National-winning jockey Bob Champion took the Helen Rollason award for achieving in the face of adversity after beating cancer. Well done to them all and here is to a great year for British Sport 2012!! This entry was posted in Sports News!, Sports Personality!, Uncategorized and tagged BBC, Mark Cavendish, Olympics, SPOTY. Bookmark the permalink.